Contains saponified oils of coconut and palm, French green clay, ground lavender, chlorophyll, & E3AFA (Aphanizomenon flos-aquae). 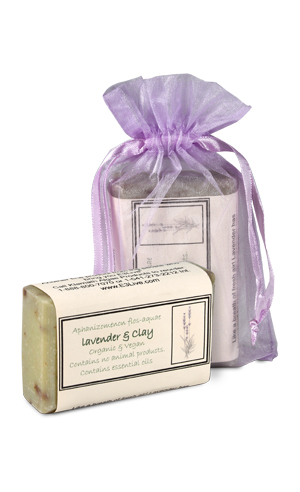 Also has essential oils of lavender, frankincense, rosemary, sage, thyme, and parsley. Saponified oils of Coconut and Palm. Water, French green clay, ground Lavender, and E3AFA (Aphanizominon flos-aquae). Essential oils of Lavender, Frankincense, Rosemary, Sage, Thyme, and Parsley. I really like these soaps, they have a nice lather and rinse clean. I just wish the scent lasted longer!